Awhile back I had mentioned that the two grandsons had started wrestling two years ago. Their twin sisters sat on the benches watching them. But this year because the coaches’ daughter and a few other girls were involved, my son and DIL enrolled the girls, along with their brothers. Here is a photo of them, the coaches’ daughter and another girl in their age group. The twins are on the far right and left. Meanwhile I finished up the gradient quilt. I am not fond of binding and had some inner wrestling in regards to keeping at it, but since there are two more quilt projects to finish up and bind, I am happy to have this off the list. This is for my youngest son; it’s a tied quilt. 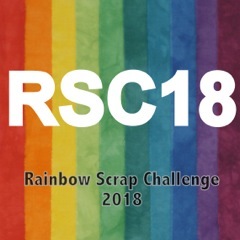 I started it last year using color suggestions from the Rainbow Scrap Challenge. After all of that a few treats were needed. I mentioned earlier that we were to have a cookout after they got back from wrestling. WHO HAS A COOKOUT in the middle of February in Southwestern Pennsylvania? Well this Februarys’ weather is very strange and it was around 63 degrees yesterday. The grill was on! Today I was down there for awhile and we were all out on the back deck, with some neighbors and friends and the children were playing outside in the yard in just long sleeves and pants and needing no jackets. While this is very pleasant and feels like spring I am a bit alarmed. Typically in May we worry about bushes, flowers, fruit trees etc. coming into bloom too soon and being destroyed by a freeze or frost later on. I have never encountered that worry in February; in winter! All of the 6 inches or so of snow shown in the last post melted, then mid-week we got another round…just enough cold and wind and swirling snow to give us a light ground cover. I baked cookies in the early morning….two baking sheets worth here in the photo and more in the oven. I generally keep a dozen here and send the other 3 or more dozen down to the kids. I have always used the Nestle Toll House recipe BUT add 1/2 extra cup flour + a handful of oatmeal to the mix. Sometimes I’ll do a mix of chocolate chips and butterscotch chips. If you purchase generic chocolate the Nestle recipe can be found HERE. Trust me, if you add that extra 1/2 cup of flour to the recipe your cookies won’t flatten and the oatmeal is just to tell yourself “this is a healthy mid-morning snack” :) Seriously I think it just adds some nice texture. As to the grandson in the middle of the picture above ( courtesy of my DIL on FB ) he has been asking for me to bake bread, so that is next on the agenda when I get in the mood. As to the one next to him, we were pleased to see this award from January at his school! :) My DIL took a photo of it when she was there. Awhile ago I mentioned that I had finished tying the Gradient quilt and binding was needed. I finally started that. The back has some skulls & roses ; my youngest is a Grateful Dead fan. I have resolved to stop all applique and *fun* hand stitching until this binding is completed. I will continue to take breaks ( I hate to sew binding ) and get a little hand quilting in, however. I have finished the blue block in Scrappy Granny and am ready to move the hoop again. I am about halfway through with the binding and may be doing my Slow Sunday Stitching at Kathy’s Quilts out on the porch on Sunday afternoon if this weather continues!